As Seen on Miley Cyrus, Marc Jacobs Hi-Shine Lacquer In BARK! The first Marc Jacobs Spring/Summer ’14 ad campaign debuted earlier this month featuring singer/actress/twerk professional Miley Cyrus. The ad features a sulky-looking Miley on a dark beach with two friends. Adding to the darkness of the photos are the star’s nails, which were painted with Marc Jacobs Beauty’s Enamored Hi-Shine Lacquer in BARK! The nail lacquer is a rich shade of chocolate-brown designed with a special formula that aims to replicate the finish and shine of 30 coats of polish. Want Miley’s nails? BARK! will be available for a limited time for Summer 2014 at Sephora, Sephora.com, Marcjacobsbeauty.com and select Marc Jacobs Boutiques. The product will retail for $18. 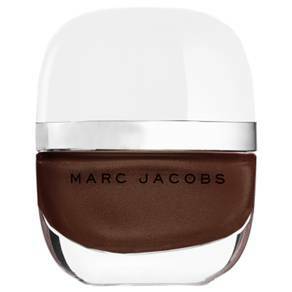 The New Marc Jacobs Beauty Enamored Hi-Shine Lacquer shade BARK!